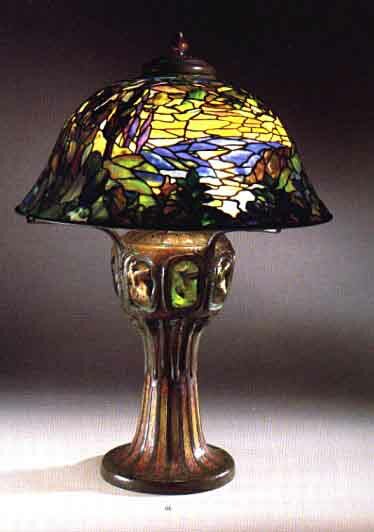 From Sotheby's 1995 Tiffany collection of John Mecom Jr.
Landscape Lamp on a turtleback Tile Mosaic Base 1899-1910. Tiffany Studios, New York 1550-1. Height 32", diameter 23.5" The pattern of this shade is a sharp departure from the geometric and floral patterns found in all other Tiffany shades. It is a rare example of a Tiffany landscape window in the round. Two other examples of this rare pattern are known and although it is listed in the Tiffany Studios 1906 price list, it most probably was a special order shade and produced in very limited numbers......this lamp is virtually three different shades depending on which side the viewer is facing. ©1995, Sotheby's New York, all rights reserved.